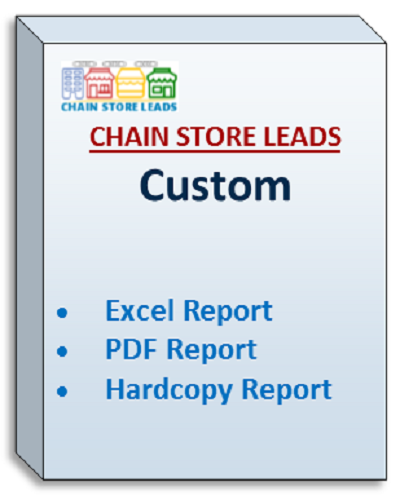 This product is a custom order of a # of leads already discussed. Change the quantity at check out to the number of leads discussed with your salesperson. They will see your order and we will reach out to you with our order completion. Please feel free to add a note to the order in your cart. Custom orders may take more time to process than an off-the-shelf order. This includes the Company Name, Company Category, Number Locations, General Name, Phone Number, Fax Number, Email Address, Company Mailing Address, Company City, Company State, Company Zip, Square Footage Min, Square Footage Max, Frontage Min, Frontage Max, Minimum Parking, Traffic, Median Income, Population, Prefer Free Standing, Prefer Strip Mall, Prefer Community Mall, Prefer Regional Mall, Prefer Endcap, Prefer Drivethru, URL to Web, URL to Real Estate Page, URL to Submit Real Estate Site, URL to Parent Company, State Contact State, State Contact Name, State Contact Mailing Address, State Contact City, State Contact Zip, State Contact Phone, and State Contact Email. Bold = Guaranteed included information. Italics = Frequently included information but not guaranteed. Normal = Our best efforts to find this information, but often infrequent and not guaranteed to be included. This package will help you find a quality tenant for your retail space! FREE 2 Day Shipping Included! Refund Policy: No Refunds in this product’s entirety, but there are refunds on parts of its data if any parts are considered defective. Learn more about our refund policy. You May Not: Sell, publish, license, allow access, or give away the any of the purchased data in its current form or any other form. Please prepare any computer’s security before purchasing our products. Learn more about our terms & conditions.